Washington, DC, a luciferian plot? A secret satanic plot revealed? There is no question that the intersections of Massachusetts Ave., Rhode Island Ave., Connecticut Ave., Vermont Ave. and K Street NW form a five-pointed star. It is also true that many of the citys architects in the nineteenth and early twentieth century were freemasons. From these two facts, and a plethora of imaginative conjecture, many writers have concluded that the city was intentionally planned to promote an occult agenda. The theories have ranged from the simple observation that the Mall bears a superficial resemblance to a masonic lodge room, to the complex ascribing of masonic significance to the position of monuments and the number of street blocks between buildings. Does the street design of Washington, DC prove that theres a masonic or occult conspiracy? To even pose such a question a number of assumptions have to be made. One has to assume that the pentagram is a uniquely evil symbol; assume that it is highly valued by freemasons; assume that they believe that its physical presence can have a real impact on the worlds affairs; assume that freemasons are responsible for intentionally including it in Washingtons street plan; and assume that this will promote certain masonic, if not evil, goals. None of these assumptions bear scrutiny. First, the pentagram is not an exclusively satanic symbol nor does it have any particular masonic significance. Second, Freemasonry, promoting rationalism and freedom from superstition, ascribes no power to symbols themselves. It is not a part of Freemasonry to view the drawing of symbols, no matter how large, as an act of consolidating or controlling power. Third, none of the men responsible for the street plan have been shown to have been freemasons. Although freemason George Washington commissioned Pierre Charles L'Enfant, there is no record that either Thomas Jefferson, Andrew Ellicott or Benjamin Bannaker were freemasons. Pierre Charles L'Enfant was initiated as an Entered Apprentice but there is no evidence that he took any further interest in Freemasonry. The first of these unfounded theories seems to have appeared in 1989 with Michael Baigent and Richard Leighs The Temple and the Lodge in which, without documentation, they assert that George Washington and Thomas Jefferson interfered with Pierre L'Enfants work to impose a pair of octagonal shapes around the Capitol and the White House. The claims took an anti-masonic turn the following year1. and many professional anti-masons quickly became promoters.2. The assumptions required to believe that the position of a number of streets and buildings reveal a secret political or occult agenda have no foundation. Detail from an engraving on paper March 1792 by Thackara and Vallance, Philadelphia, Geography and Map Division, Library of Congress. Note the incomplete five point star shaped street plan immediately north of the White House. The correspondence and papers of George Washington, Thomas Jefferson and Pierre L'Enfant are clear that although L'Enfant had been hired by Washington, it was with Jefferson that he discussed the details. "The L'Enfant Plan in 1791 was not a complete architectural concept. Jefferson, who had sketched out a very preliminary plan that year, established the fundamental relationship between the executive and legislative headquarters and the public spaces connecting them." 3. "Jefferson took an intense interest.... He even sketched out street sections for guidance of the city commissioners."4. It wasn't until September 9, 1791 that L'Enfant received his first letter from Commissioners Daniel Carroll, Dr. David Stuart and Thomas Johnson5. The geometric plans of L'Enfants radial city, influenced by André LeNotres design of Versailles6. and Christopher Wrens unexecuted plans for London..." featured two focal points: the Capitol, and the Presidents House. About them as hubs, broad avenues radiate outward like spokes of a wheel, superimposed over the regular north and south grid pattern."7. The expansive axial boulevards and Gregorian/Paladian architecture was intended as a monument to the "Virtuous Citizen in the New Republic." L'Enfants sense of grandeur and Ellicotts goal of monumentality aside, the deciding factor in the positioning of major buildings was the topography.8. "But the next year, in 1792, when Andrew Ellicott, city surveyor, prepared the official plan derived from that of L'Enfant but with major modifications, it was embellished with suggestive building plans of considerable monumentality." " He also clearly places three public buildings on the Mall, enlarges the "Presidents House" complex as defined by L'Enfant, and also enlarges on the group which later became the municiple center. One can only conjecture that Jeffersons advise was obtained for these architectural additions since L'Enfant was already in official disgrace and Thornton [Dr. William Thornton, 1793-1802] was not yet in the picture."9. Note that the "major modification" were not to the the streetplan but to the design of specific buildings. As Secretary of State, Jefferson was responsible for the design of the Federal City in Washington, D.C. Although over-enthusiastic American freemasons in the past have claimed Jefferson as their own, there is no documentation to suggest he was a freemason and he does not appear on any creditable and properly researched list today. 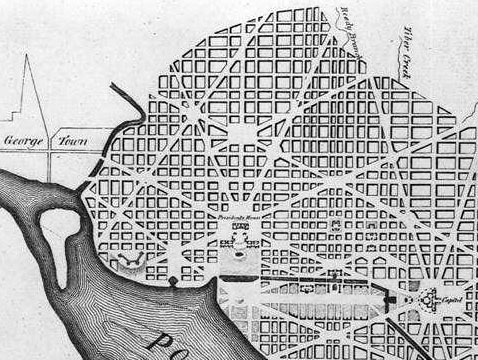 Major Pierre Charles L'Enfant (b. Aug. 2, 1754, d. June 14, 1852) drew up the "Plan of the City of Washington," between March 1791 and his resignation in February 1792. L'Enfant was a freemason, but other than the one meeting he attended to receive his Entered Apprentice degree, there is no evidence that he took any further interest in Freemasonry.10. His obituary, published in the June 25, 1825 edition of the National Intelligencer did not mention he was a freemason. 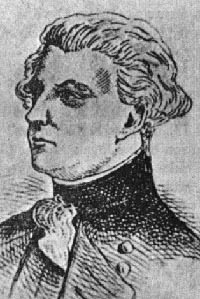 Major Andrew Ellicott (b. 1754/01/24, d. 1820), a highly accomplished surveyor, was directed by Jefferson to perform the survey of the District of Columbia. Ellicott and his assistant, Benjamin Bannaker (b. 1731/11/09, d. 1806/09/25), began work in the spring of 1791. The following year Washington asked Ellicott to finish L'Enfants plan for the city. In less than one month Ellicott found himself at odds with the Commissioners and resigned from the project. Neither Ellicott nor Bannaker have any masonic record.11. An April 28, 1791 newspaper account of the dedication ceremony of the cornerstone marker at Jones Point mentions Ellicott as determining the markers location but does not identify him as being a Freemason. Drawing lines on a map of Washington, DC proves nothing other than the physical existence of streets and buildings. A map of Sandusky, Ohio, on the other hand, might be more revealing. Stanley Elkins & Eric McKitrick, The Age of Federalism: The Early American Republic, 1788-1800 (New York: Oxford University Press, 1993). Bob Arnebeck, Through A Fiery Trial: Building Washington, 1790-1800 (Lanham, Md: Madison Books, 1991). William Tindall, History of the City of Washington (Knoxville, TN: 1914).